Sampson's now offers its patients the MyoPro™ orthosis, a powered brace that supports a weakened and deformed arm for functional use. 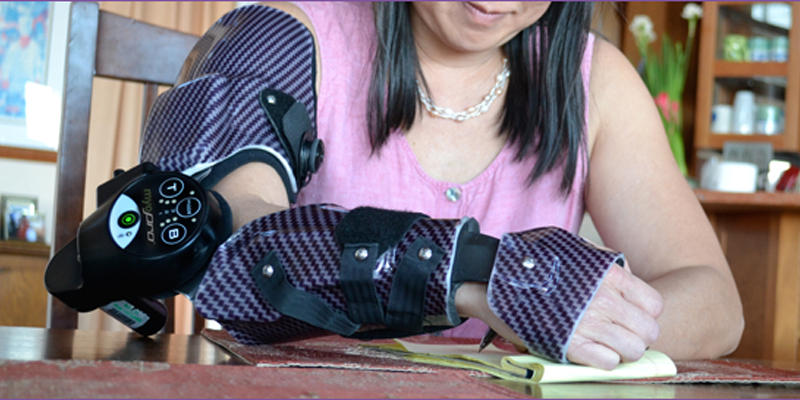 The MyoPro can reinitiate movement of a partially paralyzed arm to enhance function and quality of life. It is designed for individuals with stroke, MS, ALS, brain and spinal cord injury and other neuromuscular disorders. When the user tries to bend their arm, sensors in the brace detect the weak muscle signal, which activates the motor to move the arm in the desired direction. The user is completely controlling their own arm; the brace amplifies their weak muscle signal to help bend and move their arm.